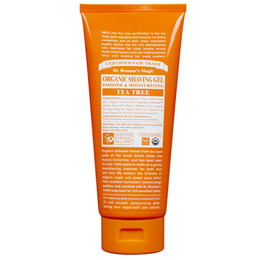 Dr Bronner`s Organic Tea Tree Moisturising Shaving Gel utilises natural ingredients with eco-friendly practices, it is the answer to the perfect shave! Containing a pure Castile Mild Soap base which ensures a luxurious lather, the shaving gel is enriched with natural oils and organic shikakai, a natural cleanser found in the seeds of the Acacia Concinna tree. It is extracted from organic sugar and grape juice for an unrivalled moisturising experience. Promising excellent hair lift and a close shave, this gel will glide smoothly onto the skin and leave you feeling silky, smooth and invigorated. Dr Bronner`s is an independently owned, family business that dates back 150 years. Dedicated to making natural organic products for the greater good of mankind, these products are also known for their quality and multiple uses that are sure to make your life easier. Dr Bronner`s soaps are 100% true pure-Castile soaps that use certified organic ingredients under the fair trade act without animal testing. They have created or partnered with various fair trade organic projects all over the world. Dr Bronner`s fair-trade and eco-friendliness beliefs ensure fair prices, living wages and community benefits for farmers, workers and their families. Organic Sucrose*, Organic White Grape Juice, Organic Coconut Oil*, Potassium Hydroxide**, Organic Olive Oil*, Organic Shikakai Powder, Organic Hemp Oil, Organic Jojoba Oil, Organic Corn Starch, Organic Tea Tree Oil, Citric Acid, Tocopherol. 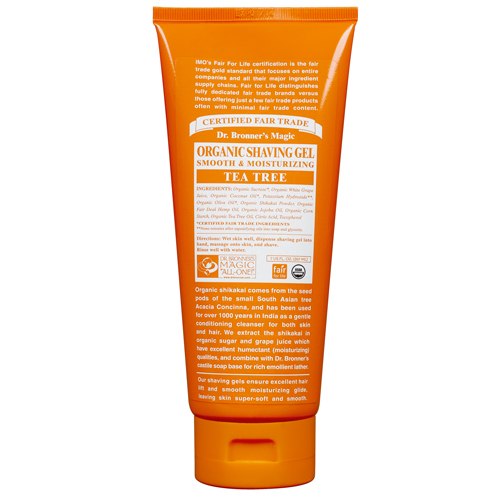 * Certified Fair Trade Ingredients, ** None remains after saponifying oils into soap and glycerin. Wet skin well and dispense into hand. Massage onto skin, shave and then rinse well with water. Below are reviews of Dr Bronner`s Organic Tea Tree Moisturising Shaving Gel 207ml by bodykind customers. If you have tried this product we'd love to hear what you think so please leave a review.